Normally, the spinal cord and brain are bathed in a fluid called cerebrospinal fluid. 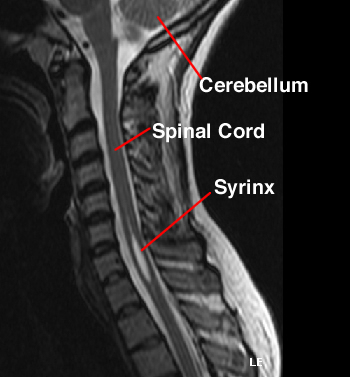 Syringomyelia is an accumulation of spinal fluid that actually forms within the spinal cord. This accumulation is called a syrinx. Most of the time, syringomyelia is caused by Chiari malformations, which is a birth defect of the back and lower part of the brain. Sometimes syringomyelia is caused by hydrocephalus, tethered spinal cord, tumor or other rare causes. Syringomyelia is diagnosed with MRI. 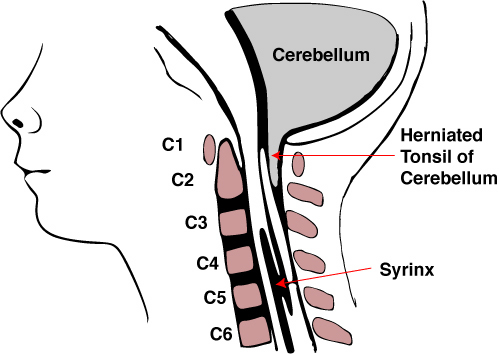 Small syrinxes or hydromyelia in the spinal cord can be a normal finding. Large syringomyelia requires surgical treatment. The treatment is directed at the cause of the syrinx, such as Chiari I malformation, or Tethered cord, rather than the syrinx itself.